Much of the statistical work that we have done here at Modern Fitba is to try and identify performance indicators for Scottish football. Whether looking to see who is the best player or team, we have typically focused on these type of numbers so far. What we will focus on in this article are stats that can help describe how a club plays. There are no “good or bad” numbers here or “right or wrong” way to play. If it works for your club and they are successful doing it, more power to them. Even before we lost our previous access to data here at Modern Fitba, we did not have the level of data necessary to calculate. Thanks to all of you wonderful people, we were able to partner with the fine folks at Ortec to get access to data that we can use to calculate these metrics. We hope that with these data we can continue to provide analysis not seen elsewhere on Scottish football. The first metric we will be looking at is something that has been around for a bit. Passes per Defensive Action, also known as “PPDA” is a metric that can measure how intense a team is pressing their opposition when they do not have the ball. PPDA’s name gives you the formula needed to calculate it, dividing the number of passes a team concedes in their own half by the number of defensive duels that team makes. For this metrics, a lower number means you are allowing your opponent to pass the ball less and we can assume you are applying a more intense press. 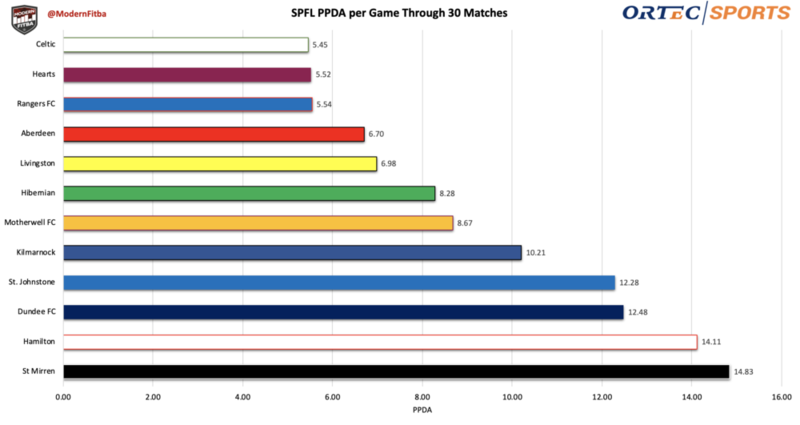 I first saw PPDA mentioned on Statsbomb from Colin Trainor and had hoped to apply it to Scottish Football. It is probably no surprise to most that Celtic allow the fewest passes per defensive action in the Premiership, but there are a few surprises in the rest of the top 6 for lowest PPDA clubs though. Hearts are nearly identical in PPDA to Rangers, conceding 0.02 passes less than the blue half of Glasgow. This shows the intensity that Craig Levein’s side work to win the ball back in their own half is up there with Celtic and Rangers. When Hearts have been at their best this season, they have been aggressive trying to regain control of the ball from their opponent. The goal against Celtic in their 1-0 win below is a good example of this. Another club that some may be surprised to see up among the top half of PPDA numbers in the SPFL Premiership is Livingston. Livi have defied expectations so far this season in their place in the table and when we compare their stats to what most clubs we would consider to be a similar size, it is clear that Livingston have tried to do things differently. While clubs such as St. Mirren and Hamilton sit at the bottom of the PPDA table, where we can assume that they sit back and try to stay organized and soak up opposition pressure, Livi have been more aggressive trying to win the ball back. Thus far, it has helped lead to success for the Lions. In January, I was fortunate enough to be able to attend the Opta Pro Soccer Analytics Conference in Chicago, Illinois where I got to hear some great speakers discuss some of the work in football analytics that they have been working on. I left the conference with a notebook filled with ideas of things to apply to Scottish football, the only problem being that I had no data to apply these ideas. Now that we are back with data, I can finally apply some of these ideas. One of these ideas was measuring how a team builds up on attack with the number of passes they make in the final third divided by shots taken. The thinking here being a more direct team would have a lower number here going “route one”, while a team maintaining possession and passing would have a higher number. With our partnership at Ortec, we can finally look at this for the Scottish Premiership. Again we see Celtic with the highest number of passes per shot taken, which probably is not a surprise to many. Most of the year under Brendan Rodgers, Celtic were focused on controlling the ball and have had to try and break down packed defenses using short passes in the final third. The two teams after Celtic are definitely surprising though. Dundee and Hamilton are second and third respectively in final third passes per shot taken. Of course, if you do not take many shots, it is less important how many passes you are making to lead up to a shot. Dundee and Hamilton have the two lowest shot totals in the league so far by some margin. However, we have discussed Hamilton’s shift in tactics since Brian Rice has taken over for the Accies. It may not be Brazil 1970 at New Douglas Park and the Accies are still very much in a relegation battle, but it seems that Hamilton are going to try and save themselves from going down playing more attractive football than we saw under Martin Canning. On the other end of passes in the final third per shot metrics in the Premiership, we see Hearts and Livingston. We had just discussed how both clubs had some of the higher PPDA metrics in the league. Now we see both play some of the fewest passes per shot on average in the Premiership. Both clubs have been accused by rival fans of playing “route one football”, but I think it is again important to emphasize that there are no “good” or “bad” stats when it comes to these metrics. Furthermore, it makes sense given how well Hearts and Livingston are at winning the ball back from their opponents in their half that they would want to transition to attack and try to break quickly with numbers to get shots. In addition to looking at how a team plays in defense and on attack, we can also use these types of stats to look at different portions of a team’s season. For example, perhaps your club’s manager controversially left to go to another job in England without warning and a manager who started the season at another club in the league was appointed in an interim basis. Celtic provide a good case study to see how these type of metrics can be utilized if a managerial change occurs in a season. Through the 27 matches under Brendan Rodgers, Celtic averaged 5.65 PPDA and 10.42 passes in the final third per shot attempt. In the small sample since Neil Lennon has taken over, Celtic have averaged 3.67 PPDA and 12.37 passes in the final third per shot attempt. Of course, this is a very small sample and limited conclusions should be drawn from these stats under Lennon, but it seems he has had Celtic pressing more intensely as well as using passes to try and break down opponents on the attack. These stats can provide both short and long term snapshots at how a club has been playing stylistically. Now that we have partnered with Ortec, we hope to continue to use these number to analyze Scottish football. Thanks to those who contributed to our crowd funding campaign, we can bring this type of analysis for the SPFL Premiership.